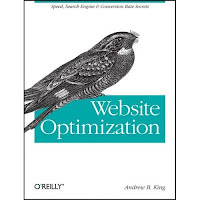 Author Andrew King, president of Internet marketing firm Web Site Opimization, LLC has really done it. In Website Optimization: Speed, Search Engine & Conversion Rate Secrets , he gives away all the secrets of creating a website and search marketing program that effectively sells products and services. King’s book makes it possible for any business to improve its online performance. Or at least almost any business. There are still some specialized skills required—it certainly helps to have some background in online marketing, web analytics and HTML coding—though King’s clear and concise prose removes a lot of the mystery. The book is divided into two major sections: Search Engine Marketing Optimization and Web Performance Optimization. It pays for itself in the first 50 pages—two chapters covering natural search engine optimization and an organic search case study. While much of the material here is well-covered in blogs and other books, even experienced SEOs are likely to find a few new ideas here. For example, though I’ve used many keyword tools and even written about some of the best keyword research tools here and here, I somehow managed to overlook Wordtracker’s free keyword suggestion tool, which uses data from Dogpile and Metacrawler to estimate search volume across all search engines. “Create your keywords tag using your master keyword list and the visible words in your page. Although you can separate keywords with a comma or space, omitting commas will give you more proximity hits between adjacet terms.” King recommends using up to 30 words, with specific key words repeated up to four times. “After title tags, headlines are the most important component of web pages for search engine rankings…Include the primary keyphrase of your web page in the first-level header…The main header should describe the content of the page succinctly in 40 to 60 characters.” Use real header tags (h1 through h6) rather than “fake” p-class tags in your CSS files. And keep in mind that h2-h6 tags are just as important, possibly even more important, than h1 title text. Use the free Marketleap.com link popularity tool to compare your site against competitors on inbound links. He recommends using compete sentences in title tags and keeping these to 10-15 words and no more than 60 characters total, but I’ve seen excellent SEO results using short, keyword-rich phrases and up to 80 characters. He also recommends using up to 250 characters for the description meta tag, though moost other guides I’ve seen recommend no more than about 150 characters. He writes that “(getting) more inbound links…especially from high pagerank sites, is the most important way to increase your search engine rankings.” While there is no question that links are very important for SEO, particularly high-value links from authoritative sites, it’s not at all established that this is the most important factor in rankings. For example, WeOpenYouClose.com ranks #1 on Google for both “call center M&A” and call center mergers acquisitions despite having almost no external links pointing to the site. He recommends paying for links. Given all the concern over Google banning sites for engaging in this practice, it’s best to avoid this. In fairness to the author, Google may have changed its algorithm in this respect after the book was published, making his advice accurate at the time of publication. But those are relatively minor quibbles. On the whole, the first section of King’s book is a top-notch primer on SEO. The book’s guidance on pay-per-click (PPC) advertising is, if anything, even more comprehensive than its SEO tutorial. King walks the reader through the entire process of keyword selection, ad group design, ad writing, bid optimization, landing page design, quality scores, geotargeting, metrics and analytics, testing and ongoing optimization in a detailed yet easily understood manner. My only criticism of this section would be the inclusion of some fairly complex mathematical formulas for calculations such as confidence interval testing and conversion rate profitability that make the PPC management task seem more complicated and intimidating than necessary. In general, the answers will be obvious without the need to resort to such calculations. On the other hand, it’s good to have these formulas on hand in case they are ever needed. The second half of the book is written with the same clarity and economy as the first half, but is much more technical than marketing-oriented. The final five chapters cover web page load speed optimization, CSS optimization, Ajax, advanced client- and server-side performance optimization techniques, and website optimization metrics. In all, King’s book is not one to be read and then set upon a shelf, but one to keep handy on the desktop and refer to frequently as a marketer or online marketing team works through the process of creating an optimized website and maximizing its sales or lead generation potential. What are the four stages of Twitter enlightenment? How important is Twitter for business? How can you get more retweets and efficiently manage unfollowers? How exactly did Dell generate so much revenue by Twittering? What are the “secrets” of top corporate Twitterers? Learn the answers to these questions and others here in more of the best blog posts and articles from last year on Twitter techniques, tools and tactics. Jason Hiner brilliantly summarizes the path to enlightenment of the typical Twitter newbie, from “confusion and indignation” through the use of tools and mobile messaging. Great advice for newbies, and experienced Tweeters will likely get a smile of recognition out of this post as well. The title may not sound promising to experienced Twitterers, but in this excellent post, Jill Kurtz notes that less than 1/5 of 1% of all tweets get 100 retweets—the level considered a “home run” for a Twitter post—then provides helpful tips for getting into that retweet stratosphere, such as including “pls RT” with tweets, keeping tweets short enough for others to retweet without editing, and asking for RT’s only for relevant content. Clay McDaniel offers some basic but solid advice in this guide to making Twitter work for marketing, such as pick a leader (so there is “one personality driving the charge”), establish a regular rhythm, and “talk like a real person” (not as obvious as you might think). Three other articles from iMedia Connection worth reading are 7 marketing mistakes to avoid on Twitter by Rodney Rumford, Meet the brands that ‘get’ Twitter by Michael Estrin, and 7 tips for the perfect Twitter profile by Jason Baer. Ron Jones reviews popular Twitter tools, offers tips on finding the right people to follow while growing your own following, and provides a basic guide to understanding Twitter lingo. This post is an excellent starting point for those new to Twitter. Gyutae Park details a real-world case of how to use Twitter to drive traffic to worthwhile content, using a hot topic, your network of followers, social bookmarking sites, the Tweet This WordPress plugin, a helpful follow-up article—and a bit of luck. For anyone still using a “canned” Twitter background found somewhere on the web, or worse, one of Twitter’s own default backgrounds, this post provides the technical specifications—file dimensions, size, coordinates and instructions—for creating a custom Twitter background image. Gareth Jones heaps scorn on eight global brands that got Twitter wrong, and explains why their strategies (or lack thereof) went awry. Astoundingly, as of May of this year, major brands like McDonalds, Pepsi, Vodafone and Gucci each had less than 1,000 followers. This article lets you learn from their mistakes.